has taken the concept of hosting a simple “Garage Sale” to a whole new level. Imagine farm fields, their grassy carpets filled with hip vendors perched on chippy stools, smiling under sparkling white tents. Barns filled with stitched banners made from aged bark cloth, floral, and linen announce, Little Olde This or That. A vintage fair for the seekers of all things timeworn, pretty, cherished or repurposed. An opportunity to recall moments from the past. A chance to whisper, I remember. Wooden shelves are lined and brimming over with yesterday’s treasures or necessities. My eyes spy the china saucers, their mate cups now long gone. Floral chintz, calico and full blooming roses adorn the plates. Sugar bowls, their lids long ago cracked and broken, perfect vessels to fill with hot soy wax and candle wicks. License plates stack in wicker baskets. Each precious piece holds a story from once upon a time. Yet these bespoke pieces are not lost or forgotten. There are still souls that cherish the dusty and worn. 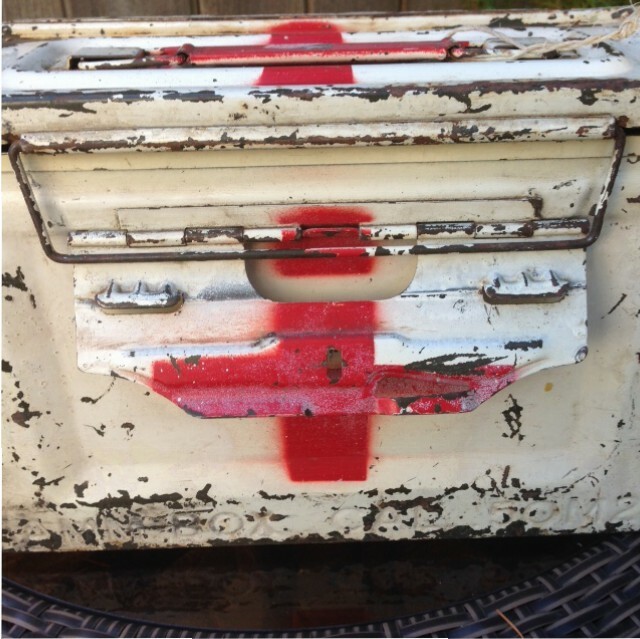 I pause to behold an old tin medic kit, the red cross sprayed and stark against the white background. The battered tin rusted in spots, blackened down to the metal. I imagine the urgent fingers that lifted the latch and searched for the proper bandage or wrap to staunch a flowing wound. My eyes discover a wooden drawer, stacked upright and alone. Walk away. 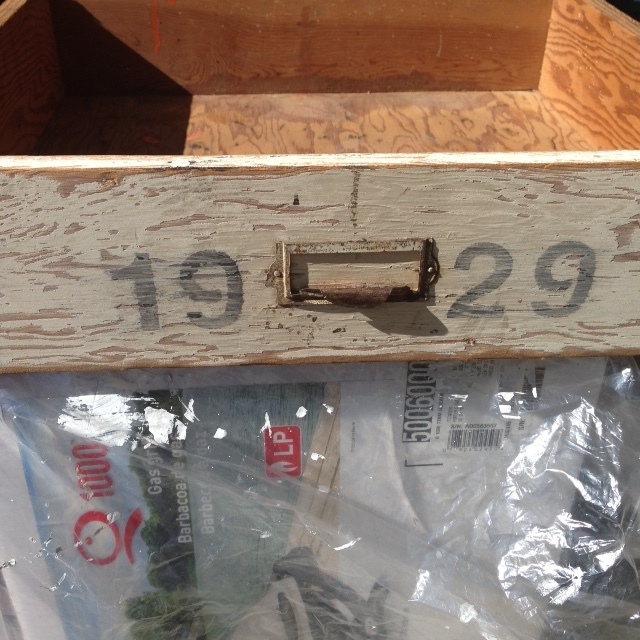 On the front of the wood, stamped in black paint, are the numerals 1929. There is a tender reason I covet such a humble piece. I wonder about the careless owner who dripped the bright orange paint inside the once pristine space. 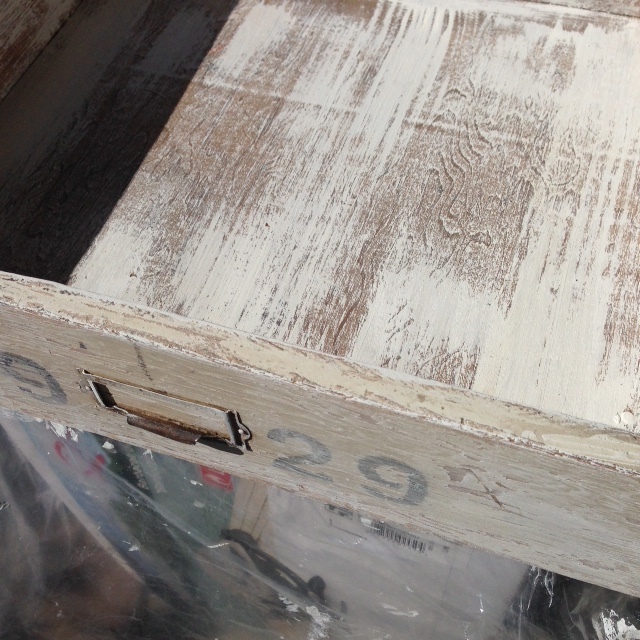 Is it just an old drawer? Never. Carefully, I lift my new found treasures from the trunk of the car and place them within the fading light. I consider their loveliness. An old soul stirs and smiles. Gently I polish to reveal each item’s patina. Shabby yet chic.Timeworn Elegance. What about the drawer, you ask? I open a trusted tin of annie sloan chalkpaint. My brush strokes cover up the spilled flaws. Suddenly the old drawer softens and suggests a usefulness. 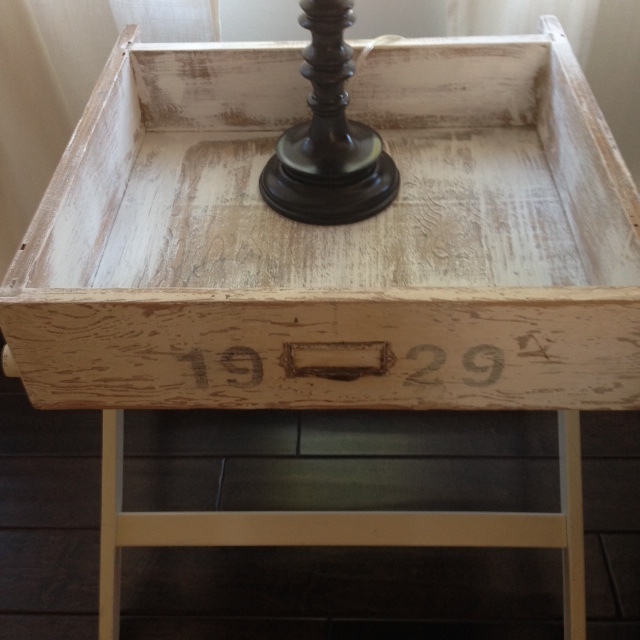 A set of folding legs from an old, IKEA tray table are the perfect item for the drawer to nest upon. Repurposed gorgeousness and regal status. 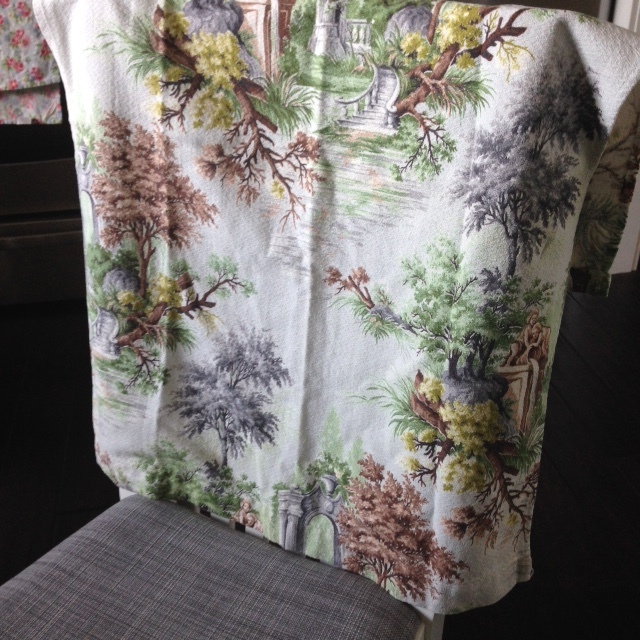 A piece of barkcloth in pristine condition waits to grace my kitchen. Salvaged bits from other lives and stories that live on. You’ve made the recycling of old things sound magical Lynne.